Kelly McClymer loves history, fairytales and her iPad. 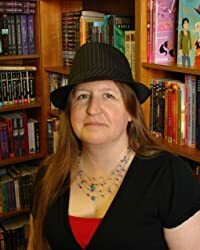 She writes romance, fantasy, science fiction, YA, and mystery. Currently she is engaged in a writer’s-block-busting Million Word Adventure to write a million words in four months. I find people endlessly inspiring. What makes us do the things we do? That’s the question I explore with my characters. Once I have the characters formed in my mind, though, they tend to take over and start asking their own questions, which keep me writing, so I can find out the answers. I am not a good outliner. I used to write from page one to the end in a linear fashion. Now I skip around (and move things when I revise, too). I learned a technique that still works for me after having to pull a complete manuscript apart and put it back together to fix some story problems: I write one sentence about every scene I’ll need in the book (for example, protagonist meets talking dog; talking dog is captured by Dogcatcher before he can tell protagonist the secret password, etc.). It takes me one or two days to lightly outline the story that way, and nothing is set in stone. I started using 3×5 cards to help me keep track of scenes and make sure they did everything they needed to do for the story. Now I use a program called Scrivener, which lets me write whatever scene is strongest in my mind at any given moment. I can see my scene and chapter notes on a corkboard, and can catch story problems that way. I will sometimes talk out dialogue aloud, just to see how it sounds. But mostly I inhabit the inside of my character’s minds. Sometimes, with the stubborn ones, I will break the “third wall” and ask them direct questions, like “Why won’t you tell her you love her? It’s past time!” That usually results in some useful insight and scene ideas (but rarely does it result in my getting what I thought I wanted from the character at the time I thought I wanted it from the character). Writing is supposed to be fun. It is hard, yes, but it should not be miserable. If you’re having an awful time writing something, stop and figure out how to make it less stressful. Misery usually comes from setting unrealistic expectations (that a first draft will come out polished, that you can’t write the dialogue first and then go back and flesh out the action, or vice versa). I like to remind myself that the blank page is always less friendly than a skeletal scene that needs to be fattened with details and specifics. I published my first ten books the usual way, through a publisher. Then my first seven books went out of print and I got the rights back. I decided to self publish them and loved the process so much, that I decided to keep going that way. For now. Who knows what I’ll decide to do next year. I think there are two important components to publishing — readers, and writers. As long as readers and writers can reach each other, life will be good for us all.